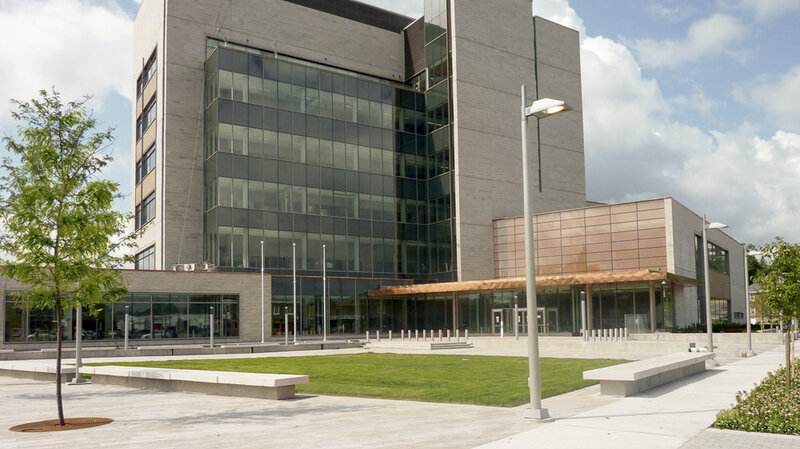 The Quinte Region Courthouse is a major civic building and urban presence in Belleville. Quinn Design Associates developed a site plan with a range of distinctive landscape areas and with special attention to providing a variety of responses to the site’s security offset requirements. The entrance plaza is a formal space that addresses the security and safety considerations unique to significant public buildings. The design features an elegant and linear geometry with stone-clad benches and a formal lawn to soften the effect of the paving. The plaza also includes a “rain garden”—an attractive area of wetland perennials in a bed that collects and naturally filters rainwater runoff from the pavement before it is allowed to drain out towards the adjacent Moira River. Quinn’s design includes a heavily planted streetscape that balances the presence of this six-storey building within the existing city, as well as a landscaped community space with a curved wall that showcases murals of historically significant events.